President Emmerson Mnangagwa's administration was Monday ridiculed as farcical after it backtracked on the controversial appointment of a finance ministry spokesman whose social media corruption allegations forced the prompt suspension of senior central bank staff. Reserve Bank of Zimbabwe (RBZ) governor John Mangudya confirmed the suspension of four senior bank officials after they were accused of corruption and illegal foreign currency dealings by new finance ministry spokesman Acie Lumumba on social media. "The Bank suspended the quartet from employment for an indefinite period to pave way for the investigations," said Mangudya in a statement. 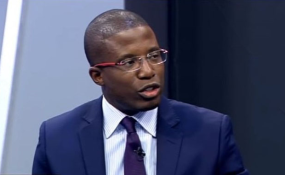 Lumumba was last Friday appointed chairperson of a so-called communications task-force for the treasury by finance minister Prof Mthuli Ncube. But the information ministry took to Twitter Monday to declare that Lumumba was never appointed Treasury spokesman. "Minister of Finance, Hon @MthuliNcube would like to inform the public that he doesn't have a spokesperson outside institutions of govt," the ministry explained. "Regarding the 'Communications Taskforce', he is yet to operationalise it as he is dealing with requirements of PRAZ & Civil Service Commission." Asked about the official letter appointing Lumumba which was signed by Prof Ncube, the information ministry said the development had been a mistake. "Mistakes were made but advice from govt lawyers indicate there are legal housekeeping issues regarding the Procurement Act Cap 22:14 which need to be regularised and the Ministry of Finance is dealing with that," said the information ministry. However, the information ministry's attempt to backtrack from Lumumba's appointment was ridiculed by government critics, among them the exiled former cabinet minister Jonathan Moyo. Prof Ncube, who is also active on Twitter, did not comment on the matter. Lumumba however, dismissed the information ministry's statement, saying bureaucrats there were "captured". He vowed to continue with his job. The saga is seen as part of a behind-the-scenes turf war between President Emmerson Mnangagwa and his deputy Constantino Chiwenga. With the economy plunging, control of the central bank has become critical as the country's foreign currency shortages worsen. Mnangagwa is thought to want RBZ head John Mangudya out as part of wider reforms that have already seen technocrats brought into treasury in Prof Ncube and former Barclays boss George Guvamatanga.